Overview - Rachel, a talented attorney at a top New York law firm, a generous and loyal friend is, unhappily, still single...as her engaged best friend Darcy is constantly reminding her. But after one drink too many at her 30th birthday party, Rachel unexpectedly ends up in bed withschool, Dex, the guy she’s had a crush on since law school, who just happens to be Darcy’s fiancé. Meanwhile, Ethan, Rachel’s constant confidante and sometimes conscience, has been harboring a secret of his own, and Marcus, an irrepressible womanizer, can’t keep his mind out of the gutter or his hands off any girl within reach. Have you ever watched a movie and simply thought to yourself that if the characters just stopped for one second, took a deep breath, and started to act like rational adults, the plot could be solved in about five minutes? Now of course I understand that many films are based around dilemmas that involve individuals making poor decisions, and that drama itself really only occurs in such cases -- but some movies simply stretch the level of idiocy in their protagonists too far, and sometimes the central conflict is so simple yet affected that it just feels contrived. The 2011 romantic comedy 'Something Borrowed' is such a movie. With an uninteresting, unoriginal, dull, and wholly forced premise, the film just sort of hobbles through its running time, mostly failing to succeed on any level. Though some decent performances manage to elevate a scene or two, there just really isn't much to like here, even for the core demographic it so soullessly aims to please. The plot revolves around Rachel (Ginnifer Goodwin) who celebrates her 30th birthday with a surprise party set up by her best friend Darcy (Kate Hudson). After the party, she reveals to Darcy's fiancé, Dex (Colin Egglesfield) that she had a crush on him when the two went to law school together. Dex is absolutely shocked by this bombshell and immediately confesses that he too felt the same way. They of course end up sleeping together, and from here, the two clearly perfect for each other lovers, spend the rest of the movie… well, not doing much at all actually. Dex is still engaged to Darcy and though they have absolutely no chemistry, he doesn't seem to be terribly motivated to end it, and Rachel just sort of smiles a lot. Yeah, real stimulating stuff. The main problem with the script is that the characters are all one dimensional and mostly unlikeable. Kate Hudson's Darcy is your standard, cookie-cutter, obnoxious, selfish friend. It's hard to really understand why the two women would actually be so close to begin with. Sure, there are some attempts made to humanize her and shed light on their friendship, but the writing and acting never really amount to much more than an annoying caricature. Even the characters that are supposed to be more appealing, like Goodwin's Rachel, completely fail to engage. The sweet, normally innocent, but now adulterous young woman is a totally clueless and weak protagonist. The overall arc of the story aims to reveal her gradual growth but it simply doesn't work and the moral ambiguity of her actions is never really given the weight it deserves. John Krasinski is also thrown into the mix for some reason, but his character is superfluous and his subplot feels tacked on and doesn't really add anything to the proceedings. The story itself is also extremely thin. After the initial conflict is set up, the movie just moves from sequence to sequence, listlessly dragging out the one-note premise for far too long. No real developments occur for quite some time, as the gang spends most of the movie hanging out in a beach house, and this may have been acceptable if the diversions presented were at least entertaining. Alas though, they're not. They're really not. The dialogue is boring and the attempts at humor are simply not funny. In fact, the efforts are so not funny, that I started to question if the movie even wanted to be a comedy. Suffice to say, there are no real laughs to be had. As if the lack of successful jokes wasn't bad enough, the story's attempts at romance are pretty terrible as well. Flashback scenes meant to enlighten the strong bond between Dex and Rachel end up falling flat, while scenes of the two in the present are undercut by the characters' mutual stupidity. To be honest, between the humorless jokes and banal dialogue, I don't think there's one worthwhile line in the entire film. All of these faults don't even take into account the overall lack of originality found in the actual concept. At its core, this is a movie about a woman being in love with her best friend's fiancé. That's it. That's the whole story. How many times have we seen that before? While I don't necessarily expect or even want some sort of high concept twist, for the life of me I can't understand what seemed even remotely appealing about this particular take on such tried-and-true material that would even justify its existence. It's trite, pedestrian, and poorly written -- though it is based on a bestselling book, so actually, never mind. Mystery solved. 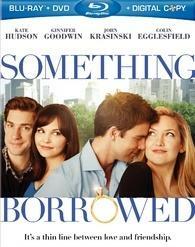 'Something Borrowed' is a meandering exercise in generic filmmaking. The characters are unsympathetic, lifeless, and annoying, and there's really only enough substantial material here for about fifteen minutes of story. Fifteen minutes that are then painfully stretched out to fit a nearly two hour running time. When I started writing this review I honestly didn't expect to be so hard on the movie, but the fact of the matter is, it isn't funny, it isn't romantic, and it just isn't good. While I'm clearly not the target audience for something like this, I really doubt that even big fans of the genre will find much to enjoy. This is just another easily avoidable entry into formulaic mediocrity. 'Something Borrowed' is presented by Warner Brothers in a Blu-ray/DVD/Digital Copy Combo Pack. The BD-25 disc is housed in a standard case with a cardboard slipcover. A separate DVD disc is included that also contains a digital copy. After some skippable trailers, the Blu-ray transitions to a standard menu. The movie is provided with a 1080p/AVC MPEG-4 transfer in the 1.78:1 aspect ratio. Though fairly generic and never exactly impressive, the visuals do look good. The print is in pristine shape with a light layer of grain visible throughout. With that said, there is a very slight blurring quality in facial textures every now and then, as if the grain structure isn't completely resolving, but this is mostly negligible. Detail is good, and the image does offer some nice instances of dimension. Colors are very vibrant, and though they can look a tad over-saturated for my tastes, they seem to represent the filmmakers' intentions and give the video a strong sense of pop. Black levels are inky and deep but can appear crushed, especially in nighttime sequences. Whites are strong, leading to high contrast levels. This is a solid, technically sound, and essentially pleasing presentation. It's not demo material, but it suits the film just fine with good clarity and a rich, vivid color palette. 'Something Borrowed' is presented in an English DTS-HD Master Audio 5.1 track, along with French and Spanish Dolby Digital 5.1 tracks. Subtitle options include English SDH, Spanish, and French. Like most romantic comedies, there isn't a whole lot to get excited about with the audio, but what is presented is handled well. Dialogue is clean and full, with no signs of crackles, clipping, or pops. Surround activity is pretty minimal with only some minor ambient effects and music cues being sent to the rears. Directionality is also negligible, though effects do make their way around the soundstage when appropriate. Dynamic range and bass activity are mostly flat, but the low end does pack some punch in several party scenes and in some of the pop music selections used in the soundtrack. Balance between all of the elements is fine, with speech getting priority. 'Something Borrowed' sounds exactly like you'd expect a modern romantic comedy to sound, with an emphasis on dialogue and popular music tracks. The score swells up at all the right moments, and while not very diverse or impressive, the mix does everything it's supposed to do. Warner Brothers has put together a mostly superfluous collection of supplements, including deleted scenes and some Blu-ray exclusive behind-the-scenes featurettes. All of the extras are presented in 1080p with Dolby Digital 2.0 sound and English and French subtitle options. Left Off the Guest List: Additional Scenes (HD, 8 min) - Four deleted scenes are included, viewable separately or together. None of this material is all that interesting, with just a few more reveals of manipulation from Darcy, but a rather lengthy cut scene from the beach house might amuse fans. 'Something Borrowed' is a derivative, pedestrian, and simply uninteresting romantic comedy. The cast is decent, but even they can't elevate the poor script and direction. The video transfer is good, and the audio is solid but supplements are rather pointless and offer little value. Fans of the original book might enjoy seeing the characters brought to -- well, I was going to say life, but honestly that's not really an accurate statement, so let's just say brought to a semi-conscious state of being. For most though, this is one to avoid.